This completely functional promotional product with imprint area on the key, doubles as a business card holder. This product was recently purchased by a software development company. Think clever? Think techy? Think geek? Think software development company. This lung shaped stress ball is a fantastic awareness product. November is COPD Awareness Month and these would make a perfect personalized giveaway for events. The key to awareness product is impact and functionality. The better suited the promotional items, the better the opportunity for engagement and return on your investment in the form of participation and donation. Looking for the pine tree air freshener? We’ve got something better. This stick air freshener glides right into the air vents of the car. Brand the end, the most visible part of the product. This product can be used for the local car wash as a giveaway for patrons. It makes the perfect swag bag item for a large car show. And, can be branded and sold in auto parts stores to turn perfume into profit. This promotional umbrella doubles as a chipping target. When you see this umbrella in it’s traditional position, it looks like your average umbrella. Except for two, dog ear holes on top. Do they go up? Do they go down? 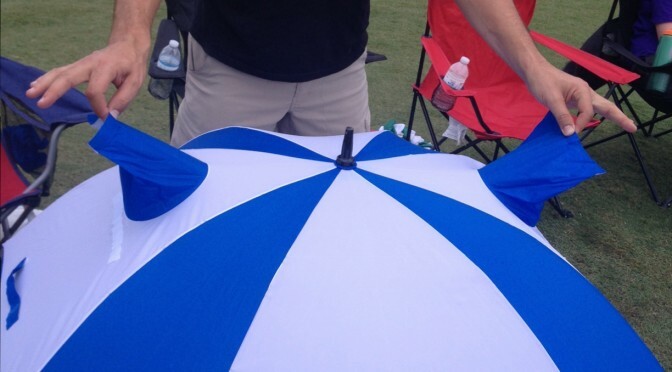 Actually, when the umbrella is inverted they serve as golf holes for chipping or putting. We don’t have to tell you that this makes the perfect golf outing prize or branded with the club or league logo and it becomes a fabulous country club self-promotional item for sale in the pro shop. Some of these branded products might not immediately come to mind for your event or organization. Some of these customizable products might even make you say “WHAT!?? !” But then again, some of these promotional items are so creative the sheer shock value provides an unforeseen return on your investment. These promotional items keep your brand top of mind long after the initial engagement and remind your audience of your unique ability to bring something to the table that sets you apart from your competitors. Do you have a picture of a branded item that made you say WHAT!?!?!?! Tell us about it here or post it to our Facebook wall. Link farming used to be a standard SEO practice. Pay people to put links to your website on irrelevant or micro-sites to trick Google into believing everyone is linking to you so that you rank higher because you seem very important. Keyword loading was also standard SEO practice. Pay people to write hundreds of articles about you loaded up with your brand name and keywords and post those on irrelevant or micro-sites to trick Google into believing everyone is reading about you so that you rank higher because your name is everywhere. Starting in 2010, Google used Panda and Penguin updates to sniff out these schemes and punish the offenders. The shift has already happened from “link farming” and “keyword loading” to “content saturation.” Content saturation is the idea that if you put out excessive amounts of content, any content, you are bound to get activity. The problem with content saturation? First, content shock: too much content and the user’s tolerance for consumption. Secondly and more importantly, relevance. Google’s current Hummingbird algorithm is brilliantly designed to combine original site links, keywords and site content to determine relevance. And the more relevant the content, the higher Google organic visibility. So, content saturation can actually hurt your brand. Many companies will blog about anything just to get your eyeballs. It doesn’t matter if the blog relates to anything they do or sell. So, while we will never write a blog just about chocolate cake…we WILL write a blog about how to bake a chocolate cake with promotional items! And, as an added bonus…we are going to throw in a pretty awesome recipe for chocolate cake! And now, the easiest, best chocolate cake recipe ever! Pinnacle Promotions recently celebrated our 20th birthday! Pinnacle owners Mitch and Dave Weintraub have been in this business long enough to see new products come and go. We decided to take a look back at promotional products that weren’t around 20 years ago when these two brothers started up the business. 20 years ago no small, cellular phones even existed. No cellular phones, no need for the Powerbank as we know it today. Bisphenol A has been used to make plastics since 1957. However in 1998 the government began to investigate potential safety concerns. A 2010 FDA report labeled BPA as potential hazardous to our health. This led to the creation of the BPA-free water bottle. Again, no small, cellular phones with touch screens no need for the Neptune Cloth screen cleaner. No touch screen, no stylus! While there were moustaches 20 years ago, there weren’t “hipsters.” Hence, the Moustache Pen. 20 years ago we were using actual boom boxes! Not, coolers dressed up to look like boom boxes that use Bluetooth technology to play music! While the clear bag may have existed 20 years ago, the clear bag for use at NFL games and other sporting events only existed since the beginning of the 2013 season in response to uncertainties following 9/11. Full-color images have been around for a while. However, the inclusion of the QR code inside the color image is new. One client used the bag as a giveaway for conference attendees. When users activate the QR code, they were provided with the conference schedule and coupons for meals and local attractions that were exclusive to the QR code users. Take a look around you right now! What things do you see that weren’t around 20 years ago? Tell us in the comments below. When you think promotional products, what comes to mind? Probably stress balls, pens, note cubes? Some janky item you’d pick up at a tradeshow? You most likely don’t think of promotional items as useful products that will enhance your next event. Promotional products are not just bland, boring products that trade style and personality for inexpensive and purely functional. The use of promotional products, especially in unique and subtle ways, can do wonders in helping to build brand awareness in your client base. Event planners and marketers, take note. 1. At an in store event, CUSP by Neiman Marcus offered refreshments to guests in simple frosted cups with their logo imprinted on them. 2. At another in store event, Neiman Marcus gave guests a sweet treat! They are sure to take these home with them and think of Neiman’s fondly as they enjoy their tasty morsel. 3. Celebrity stylist and fashion blogger, Rachel Zoe, adds a subtle hint of branding to her event by supplying logoed metallic sharpies for attendees to use. 4. She also shows us logoed office supplies don’t have to be boring with these metallic journals! 5. Sometimes, it’s not the product, but the messaging that ties everything together. Nylon Magazine lets their personality show with these simple, metallic pencils available for purchase on their website. 6. CFDA thinks outside the ‘block’ with their promotion for their studio visit with Band of Outsiders. Not sure how to find the right ‘glam’ product to enhance your next promotion or event? No matter the parameters, we have something for you! Tell us about your event and let us do the thinking for you, matching the perfect product to fit your brand and event. Trust us, we’re experts. Each day, businesses and employees are hustling to bring in new opportunities to help their businesses grow. Business guru and master of growing the small business Gary Vaynerchuck says the number one way to grow your business is to recognize that we are in a “thank you economy.” Companies can do that by making marketing efforts more personal. One way to do this is to give promotional products to your employees, customers and potential customers. 1. Match the audience: Whether your audience is your employees, clients or tradeshow attendees the best way to Make the right impression™ with promotional giveaways is to match the product to the audience. A branded credit card-style hand sanitizer would make a memorable tradeshow giveaway at a healthcare event. 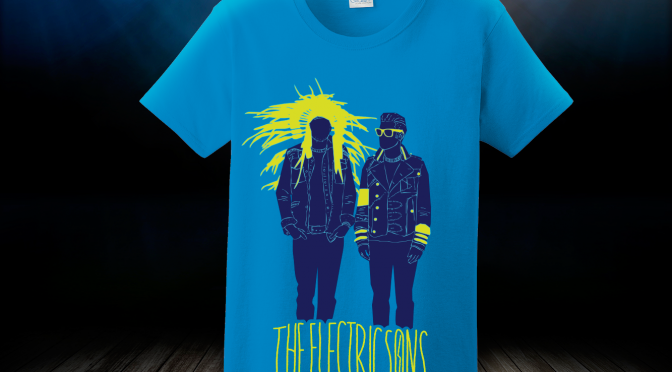 Custom printed t-shirts are ideal for the outdoor music festival volunteers. 2. Quality equals exposure: The average promotional item is kept 6.6 months. Quality outerwear such as a high-quality jacket continues to provide residual value over time. The same can be said for drinkware. The Wall Street Journal stated that a branded mug can be seen as often as five times per day by its owner. It is important to choose the right drinkware with the right imprint method to make sure the idea of quality is connected with the brand. 3. Be creative: Companies can really show off their thoughtfulness and creativity with the right promotional product. The avionic team that travels overseas will see extra value in the customized international electrical adapters. The recliner company gives customized throw blankets with to their distributors and vendors. It’s important to remember to make your marketing more personal and more specific. Knowing your audience, quality and creativity are game changers in making your brand name and services stick with potential new customers, and are key to make promotional products work for you to help attract a new audience and grow your business. Ball chair: We were surprised to see how many people thought this belonged in every cubicle. Sock Monkey: We thought to ourselves, “Sure, a playful toy.” Nope. People mentioned Sock Monkey by name. Is that a thing that we just aren’t aware of? Stress Ball: Everyone needs one of these in their cube for the coworker who won’t read the entire email. Dual-Monitor arm: Who uses just one monitor these days? Tech Toys: Our Social Media Manager is addicted to the Gwee™ Button touchscreen cleaning device. Mouse Pad: Most agreed that a wrist-rest on the mouse pad is a necessity. Phone rest: That way we can see each song change or text from our mom. This stand comes with a stylus pen! We’ve made a Pinterest Board with some of our favorites. What would you add to this list? New Blog Post by @PinnaclePromos: Every cubicle needs a WHAT?!? According to the European Promotional Products Association, a whopping 91% of consumers keep a promotional product in their kitchen. This was surprising to me, until I realized that the EPPA was talking about me. Not only do I do this, but also I might be a promotional product hoarder. The best burger place in the Dallas-Fort Worth area is called Scotty P’s. There are six locations. The menu items are the same at each location, but are named specific to that location. For example, the BBQ burger is called the Watson Burger at the Allen location, and the Warren Burger at the Frisco location based on prominent members of those communities. It’s not just the food that draws you to Scotty P’s. For years, they gave a plastic cup with each drink purchase. There was no upsell attached to the cup. You bought a drink; you got a cup with their logo imprinted on it. As loyal customers, we have more than one Scotty P’s cup. The Pink cup during October was especially sought after. Some restaurants maintain arrangements with their drink brand to provide promotional cups. These cups are usually co-branded with the restaurant logo and the drink brand logo. The Scotty P’s cups are just branded with their corporate logo. Inspired by the EPPA statistics, I decided to take a look around the kitchen. After further review, I decided I might be a promo hoarder. I own more than 30+ Scotty P’s cups. And, I don’t even live in Texas any longer. Are you one of the 55% of people who keep a promotional product in your bedroom? Are you one of the 25% of people who use a promotional pen in the home or office? Tell us: Are you a promotional products hoarder?